Opinion laced reports such as “No confirmation whether the horse was anti-national” were seen all from India Today. Many others like CNN IBN live even claimed that the MLA was “caught on camera” breaking the horse’s leg. ABP News said the MLA was “mercilessly” beating the horse. Times of India said he broke the horse’s leg after a “Beastly attack”. This obviously led to huge outrage. Soon there were source based reports that claimed “doctors have told the police that the horse’s leg may have to be amputated”. This sparked off another round of outrage that the horse might have to be put to sleep since an amputated horse was all but useless. So did the MLA really break the horse’s leg and was he “caught on camera” while doing so? The video based on which all media reports were framed showed the BJP MLA swinging a lathi in front of the horse. It was impossible to say whether the lathi hit the horse or not, but the sound suggested that the lathi was hitting the ground, which could have been done to scare away the horse. घोड़े को लाठी मारने वालो की असली खबर।This video demonstrates the power of paid media and how gullible we are when it comes to believing things. This also shows how easy it is for the ruling party to manage the media and conveniently shift attention from relevant issues. Police officers rode on horses and chased the demonstrators. Normally this wouldn’t be seen except in emergency situations, but then again the Uttarakhand police has proved how vulnerable it is in front of the dictatorial State government led by Shri. Harish Rawat Ji. Most media channels have been circulating the news that I hit a horse and injured it. Please watch this video to know the truth. I strongly condemn the action of the youth involved in this video for pulling on the horse, making the poor animal lose his balance and fall, thus injuring himself. I apologize on his behalf as this is against my personal and the party’s principles. We belong to a party which is led by the likes of Maneka Gandhi and believe in treating animals like family. I urge you to take a moment to watch this video. I will continue to represent and fight for the interests of my constituents, humans and animals alike. These fabricated stories show the levels to which the State government of Uttarakhand will stoop to to grab public’s attention. From the above video, one can clearly see, one of the protesters pulls something off a policeman riding the horse and in the commotion, the horse which was back-tracking trips over what seems to be a step and falls. More videos of the BJP protest in Dehradun have emerged since and show that while Mr Joshi did lead supporters in a charge at policemen, hitting out repeatedly with the stick, he did not strike the horse. But other protesters aimed repeated blows at the animal. Video footage shows the policeman backing the horse up a short staircase, and the animal slipping as a protester yanked at the cop, appearing to twist its leg under its own weight. In heartbreaking visuals the white horse named Shaktiman is seen hobbling on three legs, its left hind leg bloodied and broken. Indian Express: Shaktiman kept stepping back from the group of protesters, till one of her legs buckled and got stuck in a railing. Economic Times: A while later, a BJP protester caught the horse’s whip, making it lose balance and collapse with his rear leg stuck in a railing. 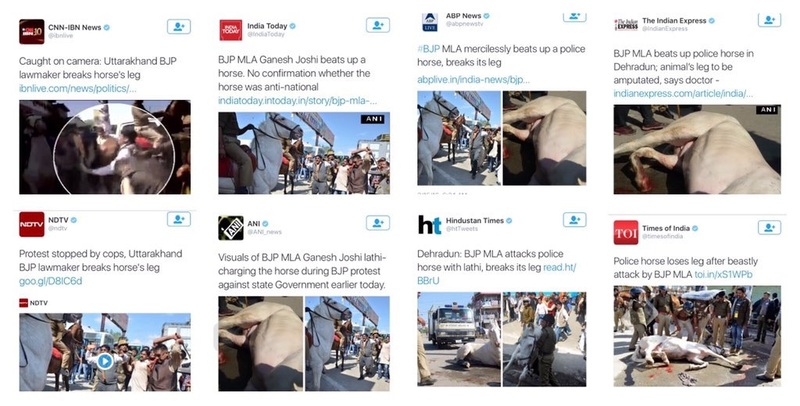 So where are the media houses who claimed to have “caught on camera”, the BJP MLA “breaking the horse’s leg”? Is it yet confirmed that India Today is an anti-factual media house? Is the media guilty of a media-trial, of prematurely smearing the name of a BJP MLA? Inspite of this, one can surely expect more trouble for Joshi, the BJP MLA, as the event has taken a political turn and the ruling Congress Government, which has been given a fake story on a platter by the media, will try to make the most of this and ensure action against the MLA. As for the horse, contrary to sensationalist rumours that the leg might have to be amputated and the horse might be put down, doctors have now said that the horse won’t need an amputation and could walk by April-end.